Anna Maria Philippine born in Mannheim, Germany. She is the granddaughter of Maria Dorothea Wild Gretsch born in Oberstein on August 3, 1788 and Anna Maria Mink von Gerichten born in Speyer circa 1800. Philippine is the 6th child and the fourth daughter of Anna Maria von Gerichten and William Gretsch. She is the 8th child of her father William. She is born just 4 days before her mother’s 33rd birthday January 8. She is the youngest sister of Fritz who began the Fred Gretsch Musical Instrument Company in Brooklyn. “In the year 1861 on the fourth of January at 7 o’clock in the morning was born here and on the 13th of the same month at 10:30 in the morning was baptized Anna Maria Philippine. daughter of Wilhelm Gretsch, honored citizen and businessman and Anna Maria, his wife born von Gerichten. Godmother was Anna Maria Philippine von Gerichten single from here.Witnesses: Franz Johann Schmitt, Citizen businessman from here and Philpp Hausser, church assistant from here. The godmother of Philippine was Anna Maria Philippine von Gerichten born April, 1842. Anna Maria Philippine was the only sister of Philippine’s mother and was 13 years younger. She was 19 years old at the time of Philippine’s christening and was already the godmother to Pauline Philippine, the third child of her older sister. The name Philippine was common in the family of this little girl’s mother. Anna Maria von Gerichten had an aunt Philippine who was her father’s older sister. She also has a cousin Philippine von Gerichten (b. 1830) who married a Taner (m 1853) named Leinenweber and lived in Pirmasens. Also importantly, on February 12, 1860 in California a little baby girl Philippine von Gerichten was born to Frederick William von Gerichten and his wife. Frederick was the nearest brother in age to little Philippine’s mother. This brother and sister were always close. Now though they lived far away they each had a daughter named Philippine. Philippine’s younger brother, Carl Peter Gretsch is born. Philippine’s father, William Gretsch sold his shares in the family home in Simmern. This is where William was born and grew up. In 1868, the government of Baden passed a new “school law”, which enabled the towns and villages to set up onon-denominational schools. Up to this year the religious communities were responsible for the public school system. Mannheim was the first town in Baden to found non-denominational “Simultanschulen”adter having reached an agreement between the Catholic, Protestant and Jewish communities in 1870. As the Gretsch daughters were born between 1855 and 1861, they most likely still went to tPortestant schools. The basic school type of that time was the eight-yea r”Volksschule”, where the children were taught in reading and writing, maths, religions, drawing, sometimes natural history , and the girls also in needle work. School fees for the “Volksschule was abolished in 1892. Philippine’s younger brother, Philip Wilhelm is born. The first war orchestrated by Otto von Bismark to eliminate Austria from German affairs and to insure the union of Germany under Prussian hegemony was fought in alliance with Austria against Denmark over Schleswig-Holstein. Casimir Gretsch, grandfather of Philippine died in Boppard. Casimir was 89 years old. August Gretsch, older half brother of Bena, signed up to serve in the US Army in New York City. Cousin Auguste Pauline Bloss died is Stuttgart. She was 29 years old and the godmother of Philippine’s older sister, Auguste Catharina born 1858. Cousin Robert Bloss died in Stuttgart. He was 26 years old. Just two days before his mother, sister of Wilhelm Gretsch had moved to Stuttgart with him from Boblingen. There is no record of Katherine Dorothea Bloss after her children died until her own death 9 years later. Austro-Prussian War ” Seven Week War” was the second of three wars devised by Bismark to unify Germany. Mannheim, in Baden sided with Austria. Prussian Troops occupied the Free City of Frankfurt and many other cities in the territories of Hanover, Saxony and Electorial Hesse. The situation caused such an upheaval that the major of the Frankfurt killed himself. After this war it seemed sure that German states would unite under Prussia. Bena first cousin, Dolly von Gerichten is born in San Francisco. She is the first child of Anna Maria’s brother Conrad Melchoir and Dorothea Timm. Later, Dolly would move with her family back to Germany. Dolly was married in Dresdan in Sept. 1889. Philippine’s youngest brother, Jacob is born. February William Gretsch, oldest sibling of Bena, sails for America. He is the son of William Gretsch and his first wife, Katharine Fick. William is listed on the ship’s list as being in the “wine” business. He will continue with this occupation in America becoming a successful wine merchant. William the eldest of the Gretsch children and the first to come to America will play a big role in the lives of his younger siblings as they follow him to America. July 8 Anna Maria Mink, grandmother of Philippine and mother of Anna Maria von Gerichten died in Mannheim. July 19 France declares war and the Franco-Prussian War begins. South German joins North German confederation, just as Bismark had figured and the unification of the diverse German states consolidates. Aug 4 German troops cross border into Alsace. September 1 German victory at Sedan. 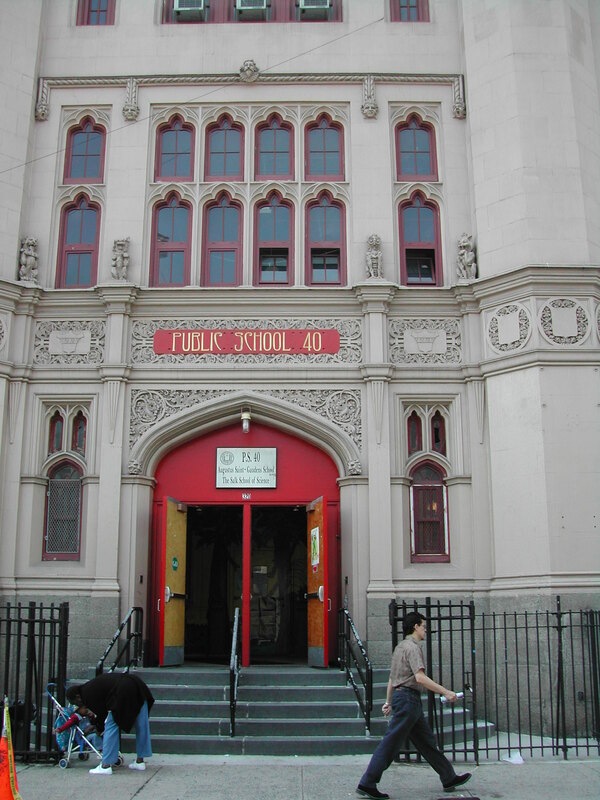 June 1 Bena’s American Cousin Emily Gretsch begins teaching in the Brooklyn school system. According to the Prussian Statistical Bureau in Berlin published in 1879, the conclusion of the peace following the Franco Prussian War ushered in a ” sudden industrial and economic boom…although it lasted only a few years”. The Gretsch family would have felt the effects of this boom. June 5 August (half brother of Philippine born March 22, 1847) sails for America. August 28 Philippine’s mother, Anna Maria Von Gerichten died. Philippine is ten years old. October 25 The first Gretsch of this generation, Pauline, cousin of Philippine sails to America. She sails on the “Vandalia” She is the daughter of Karl Gretsch brother of Philippine’s father. I believe that Pauline went to live in the household of her uncle Jacob Gretsch and his second wife, Anna Maria Artz. At this time Jacob had two daughters. Emilie born May 12, 1854 was the daughter of his first wife Rosina Blondina Artz and Wilhelmina born may 10, 1869 was the daughter of his second wife Anna Maria Artz who was the sister of his first wife. Perhaps, Jacob’s wife Anna was already ill when Pauline was sent for to help with the household. Bena is 11 years old. October Anna Maria Artz Gretsch dies in Brooklyn at 329 South second street. She is 42 years old. She leaves a three year old daughter Wilhelmina, a step daughter Emily age 16 and her husband Jacob Gretsch. These girls are first cousins to Philippine. July 15 Bena’s god mother, Philippine Von Gerichten, marries Henrich Diehl. He is a butcher and much older than his wife. Sept. Bena’s father Wilhelm Gretsch dies. October 7 In America, Bena’s cousin Emily Gretsch, is promoted to a vice teacher in 6th grade of grammar school. In this year the address of the Gretsch family changed in Mannheim. The family was no longer living on the Marktplatz. their business of “Kolonialwaren” was no longer in operation. After that the family is listed in various different places, ending up at block H7 N.28. Obviously, there was a change in the family’s status after Wilhelm died. April 11 At age 14, Bena goes to live with her godmother, Phillippine. She and her husband Henrich Diehl have only recently been married. They have no children of their own. Heinrich a well to do butcher, is older than his wife. Perhaps, this is the first time that Bena was separated from her siblings. There is no record of Bena’s life with her god mother. However, less than three years later, Bena left Germany to come to America. Bena’s quick departure for America to join her older siblings there, is the strongest statement we have about how comfortable Bena was at her god mother’s house. Nov 30 Katharine Dorothea Gretsch Bloss dies in Stuttgart. She is the only sister of Philippine’s father. June 17 Older brother Louis goes to America. Perhaps, he is joining his older half brother Wilhelm who has started a liquor business in Manhattan. February 22 In America, William Charles Gretsch is born. He is the second son of Jacob Gretsch and his third wife Bertha. Their first son Frederick died in infancy. October 16 Older sister Pauline goes to America sailing from Hamburg on “Gellert”. Most likely she goes to live with the family of her uncle Jacob Gretsch. He is now married for the third time to Bertha Wintermantal and has a nine month old son. His daughters from his earlier marriages still live with him. Emily is now a school teacher and Wilhelmina is 8 years old. February 6 Bena’s American cousin, Emily, is promoted to a vice teacher in the first grade of primary school. Brooklyn Eagle. On this same day, Philippine sails to America from Hamburg on the “Lessing”. Second Class. Passenger # 14 Philippine with a very beautifully written “P” from Mannheim. I couldn’t help but wonder if the man writing in the name of the oncoming passenger had been really intrigued with this young beautiful woman. I thought of Maggie and Mary and Heather at this age. I thought that his special care with the formation of this letter “P” could have been influenced by his infatuation with the girl herself. Or perhaps, she had written her name herself and had quite a flourish to her penmanship. Passenger# 13 Clementine Cahn 28, Gehans. Passenger # 15 George Beck 18, New York. February 21 Philippine arrives in New York at Castle Gardens. July 8 Dora is born to Jacob and Bertha Gretsch. November 10 On this date, Philippine’s sister, Paulina is married to Conrad Benzing. Pauline is living at 167 Essex Street in Manhattan at the time of her marriage. Conrad lives at 74 Third Street just a few blocks away. The witnesses were Fred Gretsch and Mary Schmann. Pauline’s Manhattan address signals that possibly the Gretsch family lived in Manhattan before they came to Brooklyn. The address is not far from Delancy Street, the present day entrance to the Williamsburg Bridge. She was married by an ordained Minister Gottfried. Scheibel, 76 Essex, Street. August Ralph is born to Jacob and Bertha. Bena is no doubt helping with this new baby. approximately February According to the Brooklyn census in the household of Jacob Gretsch, a 14 year old niece named “Bena” is found. Most likely this is Philippine. She was actually 19 years old. The census record was also wrong in recording 2 year old Dora as a son. Also in the household of Philippine’s uncle Jacob Gretsch, age 54 was his third wife Bertha age 45. Daughter Millie, age 26 school teacher, Minna, age 11, in school, son Willie age 3, son Dora age 2, and son Ralph age 6 months. They were living at 102 Lewis Ave. Most likely, Bena had come two years earlier to help out this young family. Dora was born just five months after she arrived. This picture of Jacob and Bertha is from the time that Bena came to live with them in Brooklyn. August 22 Philippine von Gerichten Diehl is married again. She is the god mother of Philippine Gretsch Morgner. Both her brother’s children in California and her sister’s children in Brooklyn would have taken note of this marriage. Feb. 14 Bena’s American cousin, Anna Maria Gerichten Wentscher (Daughter of CP Gerichten) gave birth to Elsa. Elsa would grow up and marry into the Marston family of San Diego. March 24 Brooklyn Eagle ” The Rev. Henry H. Washburn, the newly installed rector of ST. Barnabas’ Church (Bush Ave and Kossuth place), will conduct his first festival service in that parish on Easter……This programme will beinterpreted by Miss Hattie Smith, soprano; Miss Emily Gretsch contralto; Mr. Marmaduke R. S. Holgate, tenor and Mr. E. B. tompkis, bassm who constitute the quartet choir of St. Barnabas. April Wilhelmina Benzing is born in New Jersey to Pauline and Conrad Benzing. This is their second daughter. Perhaps, Bena is living with her sister at this time, helping with the new baby. One can see in the following letter, that Bena was not living with Jacob and his family at the time. Rather, she was asked to come and help out after Jacob’s death. April 23 Bena’s uncle, Jacob Gretsch dies. William Gretsch, Jacobs son remembers “Tante Benchen” coming to live with the family at this time to help with the children. William wrote this letter in September of 1961 and mailed it to his granddaughter Lucille just 13 days before he died. He is remembering back almost 80 years! Well believer you me you talk about a disciplinarian, a real “Hun”. A large tub was put on the floor of kitchen (no bath rooms) at that time) Willie- Dora – Ralph-get up come down for your wash- 3 flights of stairs and she watched you while you washed-regardless of weather down trotted for your daily wash,- Emily and Minnie where too old for her to Boss around. There were 3 boys in the neighborhood Charlie Morgan, Phil Jacobs and Billie Keeler older than I was by 3 years- Charlie Morgan was the tough kid of the neighborhood always slapping us kids around. Well one afternoon I saw this Morgan boy come down the street loaded down with groceries both hands around the bundles -Soo- I figured this was my chance- Oh was I brave! I blocked the way into his house yelled” Charles Morgan plays the Organ, Sister beats the drums, then sailed into him. I beat and kicked him to my hearts content -until he cried for his Mother- Well sir from that time on I was the Hero. Also this time of year every Thursday of mo. of Sept. an Old Darkey use to come through neighborhood with a very large tray on his head calling out, Honeyee Comb-Honeyee Comb-, which was a big treat for us youngsters 10cents a whole comb.- can you picture us kids eating honey not on a stick but flat on a piece of board. “No Ice Cream” in those days, Licorich Shoe Laces-Taffy by penny’s worth-only Molasses Taffy- made by the baker on large flat tray and he would break it up as you bought it mostly penny’s worth-no chewing gum- but peppermint lozenges and peppermint sticks- Only fruit we had was Pears and Apples- Peddlers would go though streets calling out Pie Apples, Pie Apples 10 cents a pail.- mostly green at this time of year but Mama use to put them in the cellar on a platform that Papa built close to ceiling to Ripen on stove. If you needed Milk-you would have to put a note in a can which was put out on front step outside of Kitchen door Milkman carried large gallon can with large dipper and would fill order as per note- and very often Milkman would not put cover on securely on can and when Mama went to get the Milk- all the cats in the neighborhood were drinking our Mildk but we drank what was left didn’t think any thing of it. Well by this time I guess I was about 10 years-when Billy Keeler thought up the idea of rolling cigaretes using the brown part of the corn husk (hair like part) and roll it in a piece of newspaper-I was dared to smoke one-well I couldn’t take a dare- so low and behold just as I started to smoke my sister Dora saw me and ran home to tell on me- next thing I knew Aunt Beenchen came after me- “Oh Boy” got a severe whipping and sent to bed without supper. June 17 Bertha Gretsch, widow of Jacob petitioned the surrogate court of Kings County “In the matter of Application for Letters of Administration on the Estate of Jacob Gretsch.” HIs property did not exceed five hundred dollars. Living in the household at the time was Bertha 34 yeras old, Emily 29 years old, Wilhelmina 14 years old, William age six years, Dora age 4and Ralph age 3 years. Anna Maria Gerichten Wentscher, daughter of C. P. Gerichten, gave birth to a daughter Ella Wentscher. March 24 Auguste Catharina Gretsch von Hellerman (Katie) an older sister of Philippine gives birth in San Diego California to a daughter Helma. This record was found in the “Famileinbucher” in the archive of Mannheim by Bettina Hoecherl. This find confirms the possibility that the Gretsch children were in contact with their mother’s family in California. It was not only their father’s brother, Jacob Gretsch, who lived in Brooklyn who encouraged the Gretsch children to come to America. Also, the brothers of their mother who had settled in San Francisco offered enticement. At this time Peter Karl Gerichten was living in San Diego. Bena’s sister, Auguste and her husband probably came to San Diego to be with this uncle and his family. April 28 CP Gerichten dies in San Diego. July 3 Bena’s youngest brothers, Phillip and Jacob Gretsch, come to America. Perhaps, these young men were coming to work for their brother Fred. Or perhaps they had planned to go on to California and join their uncles. They both arrived on different boats. Philip was on the “Nordland” from Antwerp. These children were also first cousin to Bena and her siblings. July 2 Wilhelmina T. Gretsch graduates from PS 25 on Lafayette Ave near Sumner. September 5 After an illness of two months, Bena’s older sister Pauline Gretsch Benzing dies at 102 Lewis Ave. Pauline has two young daughters at the time. Pauline and Wilhelmina. Her husband lives in Hoboken, Conrad Benzing. She is buried at the Evergreen Cemetery. In 1892, Bena’s 4 month old son is buried with her. In 1898, Bena’s husband is also buried with her. I assume that Pauline, came to the family house on Lewis Ave in Brooklyn to be nursed by her sister Bena. May 6 Philippine returns to Mannheim, Germany. Here she lives with her step mother, Justine Gretsch. She was taking care of her step-mother. The family no longer lived on the Marktplatz now the family lived on H7, 28. Nov 15 Auguste Katharina Gretsch von Hellerman an older sister of Philippine, returned to Mannheim as a widow. Her daughter Helma was born in San Diego on March 23, 1884. Oct 17 Philippine sails on “La Champage” from La Harve to New York. She lists her age as 25 and her occupation as servant. Oct 25 Sophia Hertlein arrived on the ship, C.Caland. April 15 Justine Fuchs Gesell Gretsch dies in Mannheim. November 16 Carl Gretsch returned to America aboard the ship “Leerdam”. Just 5 months later, Carl would be a witness in Philippine’s wedding. May 5 Philippine Gretsch marries Max Morgner. Marriage was preformed by Rev. H. Hebler living at 207 East 83rd Street. She was living at the time at 300 East 20th Street. Max lived at the same address. Max’s occupation was a “Musikengraver” He was 26 years old, she was 29 years old. Her brother Carl was a witness and Henry Stauf. Henry Stauf was found in the 1870 U.S. Census, age 4, living in Manhattan with his parents. His father Andreas Stauff was a ‘wine and liquor salesman”. By 1880, he was no longer in this business. Perhaps, Henry knew both Carl and Philipine through their uncle William Gretsch who was also in the liquor business. Their marriage certificate was found by Mary Ann Dinapoli in 2001. It had been misfiled and did not appear in the directories until 1891. The church records do not show this marriage. They were married in the Second Immanuel Church located on East 83rd street. That church is no longer extant but their records are held by the First Immanuel Lutheran Church on East 88th Street. Thanks to Ann Siemer for her careful search through the church records. Yorkville, the section of New York where Philippine was married was German enclave at the time of her marriage. September 23 Philippine’s cousin, Dolly Gerichten born in California in 1867, was married in Dresden. to Ernst Roessler. Her father Conrad Mekchoir had moved back to Germany from California. Bena no doubt knew about the wedding of her first cousin. Perhaps, this is a hint to the family’s connection to Dresden. Emily wrote in 1915 that Katie von Gerichten von Hellerman died in Dresden but no more information is given. Katie might have become connected with her California cousins when she visited California in 1884. In 1902 another California cousin, Amy Dorothy, daughter of Peter Karl and Florentin Gerichten was married in Dresden. So the family continued to be connected there. Some things, I don’t know for sure. I don’t want to pretend that I do when I just plain don’t. I do know though that spending time with people by figuring out the facts of their lives is one way of getting to know things. You don’t always have to be there. For instance, I do know for sure that on November 14, 1889 in Hoboken, New Jersey, just a few miles away from Brooklyn, New York, Nelly Bly stepped on board the Hamburg-American liner “Augusta Victoria” to begin her groundbreaking adventure of traveling around the world in less than 80 days. She was already famous for her previous work as a journalist. Women, who aspired to be writers travelers or adventurers would have been following her exploits closely. Even women who were just curious and had no plans for their own travel were keeping track of Nellie’s exploits. For weeks leading up to her departure, the “New York World” had been printing articles preparing its readership for the start of her journey. Every day after that Bly’s travel experiences were published in this well-circulated newspaper. I also know for sure that at that very time, there were several young Gretsch girls and women who were living in Brooklyn and near by New York City. They no doubt were in some way affected either by their attention to or their inattention to Bly’s well-publicized journey. Dora Gretsch was just 11 years old at the time. Old enough to read the newspapers and certainly old enough to be acquainted with the possibilities of travel adventures. Although she and all of her siblings were born in Brooklyn, both of her parents were born in Germany. From the time she was born, and even long before then her family was surrounded by family members who were traveling in and out of her father’s busy home. Aunts, uncles, cousins and even a grandmother came from Germany. Some stayed and some departed again for points west and south. Dora’s older half sister Wilhelmine was just 20 years old when Nelly sailed. Wilhelmine like Dora had been born in Brooklyn. Unlike Dora however, she would remain in the town of her birth until she was very old and only then would her traveling adventures begin. Although, Wilhelmine would be remembered (and indeed very soon forgotten) for having no big adventures in her life, perhaps, at the age of 20, she had dreams of such possibilities. But as I said, I don’t know for sure. Emilie, the eldest of the three Gretsch half sisters, was 34 years old at the time and already she had been teaching in the Brooklyn schools for 16 years. She was a woman who prided herself on her work as a teacher and a writer. She would later become a devotee of Mary Baker Eddy and there can be little doubt that she kept at least one eye focused on the press as Nelly Bly’s trip progressed. But Emily unlike her younger half sisters never left the city of her birth to live elsewhere. Not far away was another Gretsch household. Here, Fritz a first cousin to the three aforementioned half-sisters and his wife Rosa had just welcomed their 6th child into their busy household. Hertha was their third and would be their youngest daughter. This new born child was to be their most adventuresome child. She was to be also their most independent child. She would travel the furthest away from Brooklyn. She was to be the only one of their offspring who would venture to live and work in a foreign land. So I don’t stray from a truth, when I say that this new born child was also effected by the trip that Nelly Bly embarked on in November of 1889. Like Nellie, Hertha would become a world travelor. Also, not very far away just across the East River in the city of New York, lived another Gretsch girl Philippine Gretsch Morgner. Bena, as her family endearingly called her, had like all her siblings been born in Germany. In 1889 at the age of 28, she had been married just the previous May. She was the youngest sister of the aforementioned Fritz. Bena like her niece Hertha who was just newly born, was the youngest girl in the family and also the sixth child of her parents . Bena was a first cousin to Dora and Wilhelmine and Emily, all of whom were born in American. It was into their household that she and her siblings had come when they first arrived in America. Now, in 1889, having come so far herself from her native Mannheim, Bena had no more dreams of traveling. Once, the adventures of Nellie Bly might have attracted her but not now. Bena and her sister Pauline, when they were much younger and living in Germany had followed the exploits of their older cousin Pauline Gretsch from Boppard as she sailed for America. They watched closely as their brothers followed this adventurous cousin and eagerly waited their own turn. Now in 1889 Bena had been in America for 11 years. She had cared for her uncle’s American born children, both before and after his death. She had nursed her sister through a long illness and sad death and cared for her two young nieces until their widowed father brought home a new wife. She had even traveled back to Germany and cared for her widowed step mother. Bena had no more illusions about travel. She just wanted her married life now, new as it was and hopeful. Conrad von Gerichten, a brother of Anna Maria von Gerichten Gretsch, came to California with other brothers circa 1854. He was according to the 1880 census a wine merchant in San Francisco. Conrad married Dorothea Timm and had a daughter, Dorothea born August 4, 1867 in San Francisco. Her father lived for a long time in Dresdan. Conrad died in Dresden 12/26/1897. Three of his children remained in Germany, one son returned to the US. Amy Dorothy Gerichten, (b.1876, San Diego) daughter of CP ( Karl Peter) Gerichten and Florentine Timm was married in Dresden in 1902 to Doecke a merchant from Lubock. Dolly Gerichten and Amy Gerichten were cousins because their fathers were brothers but also their mothers were sisters. It is interesting to note that they were both born in California but married in Dresden. Dresdan is given as the address of Katie Gretsch von Hellerman in 1915 by Emily Gretsch. There must have been a group of von Gerichten cousins living in Dresdan in the early 1900’s….Katie Gretsch von Hellerman ( daughter of Anna Maria von Gerichten Gretsch), Dolly Gerichten Roessler( daughter of Conrad Melchior von Gerichten) and Amy Gerichten Doecke ( daugher of C.P. Gerichten). Max and Philipina Gretsch Morgner, at the time of their marriage, were living at 300 East 20th, NYC. 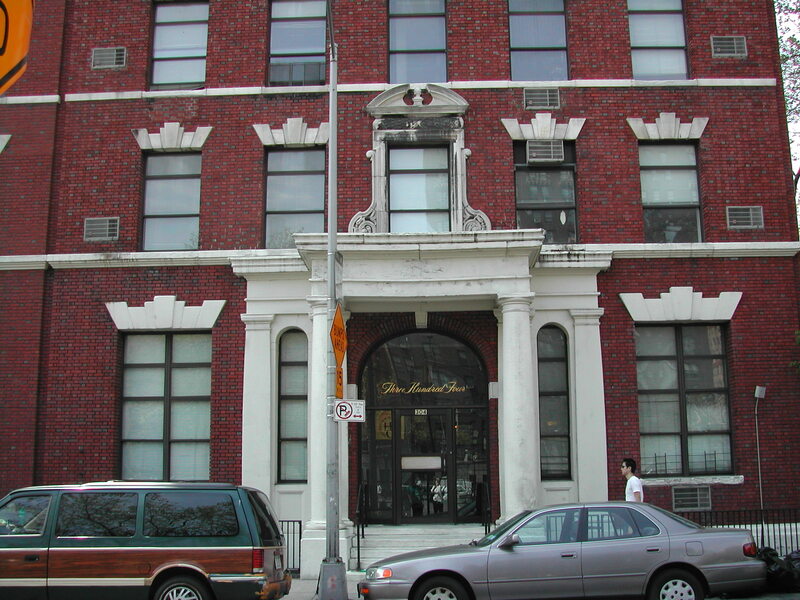 This building at 304 East 20th St is in 2003, the New York Health and Racket Club. Perhaps, the same building was there when Philippine and her husband lived nearby. In 2003, there is a children’s playground at the 300 number. PS 40 is just a little east of Philippine’s old building on the same block. This cornice is near east 20th and Second Ave and is of the same vintage as Philippine’s absent building. It is interesting that Philippine and her husband lived in Manhattan. Most of the Gretsch family lived at the time in Brooklyn. Was she perhaps, attempting to show some independence after she returned from Germany? It didn’t last long. she soon moved to Brooklyn. By 1895, Max and Philippine were back in the same neighborhood. What drew them here? Did Max have family here? March Clare Gretsch born. Daughter of Louis and Clara Gretsch. Louis is Bena’s older brother. June 30 Hertha Roessler is born in Dresdan. In November of 1889 (ca. ), Hertha Gretsch is born in Brooklyn. The two Hertha’s were second cousins on the von Gerichten side of the family. Philip Wilhelm Gretsch, Bena’s younger brother, is listed in the San Francisco City directory. 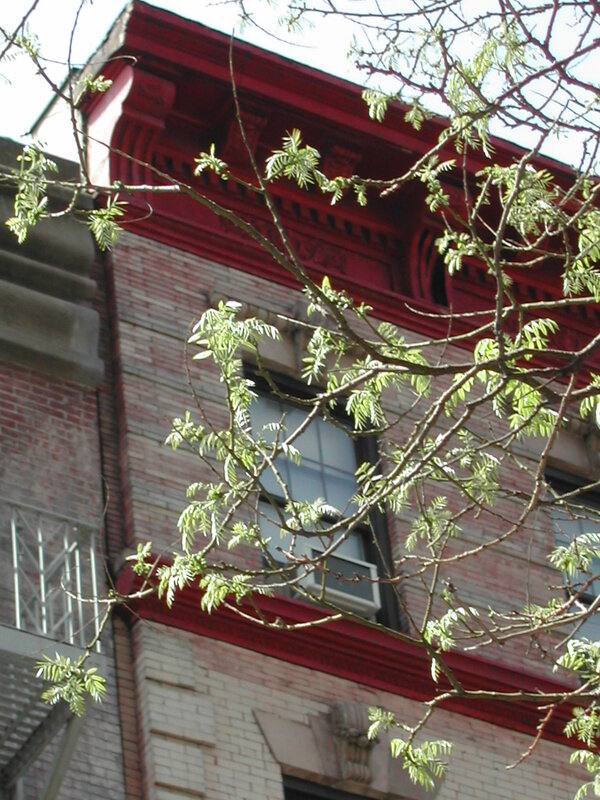 Philippine and Max lived at 319 Marcy Ave in Brooklyn. Across the street is the 47th Regiment Armory between Lynch and Hayward street. The corner stone for this impressive structure was laid on October 11, 1883. The building was first occupied in 1885 and additions were made in 1889 and 1898. Bena certainly looked at this building veryday that she lived on Marcy Ave.
Just one block east of Lynch is Middleton, where the Gretsch Factory was located. Perhaps, Bena’s husband worked with the family business on Middleton. June 17 Wilhelm Gretsch and his wife Maria return to Mannheim. June 21 Philippine’s brother, Carl aka Charles Gretsch married Sophie M.M. Hertlein at the same church where Philippine was married two years earlier. Henry Stauf was also a witness at Carl’s wedding along with Hugo Baedinghaus. Charles was living at the time at 442 Eight Ave. in Brooklyn. His occupation was a bookkeeper. June 12 Johanna Morgner, Bena and Max’s daughter was born but I am unable to find a record of her birth or baptism. She died in Los Angeles on December 24, 1954. November 4 Olga Gretsch, daughter of Louis Gretsch born. Nov. 22 Herbert Gretsch born, last child of brother Fritz and Rosa Gretsch. According to the New York State Census of 1892, Philippina, Max, their daughter Johanna lived at 319 Marcy with Bena’s brother Jacob Gretsch. Max was an “engraver” and Jacob made “surgical instruments”. Perhaps, the census taker misunderstood and “musical instruments” was his trade. Marcy Ave is about 3 blocks from Middleton Ave where the Gretsch factory was located at the time located. Bertha Gretsch dies at 340 Stockton Street and is buried with Jacob and his second wife Anna at the Evergreens Cemetery. Cause of death is Nephritis. Bena had first come to America in 1878 to live with uncle Jacob and his family. Just after Bena arrived in America, Bertha third child Dora was born. Bertha’s death must have brought back many memories to Bena. It also set in motion a round of court paper surrounding the adoption of the three minor children William who is 14 years old, Dora who was 13 years old and Ralph who was? Bena had also taken care of these children in the early 1880’s when their father died. May 5 Katie Von Gerichten from California was in New York. She was a first cousin of the Gretsch children, Bena, Fred, etc. Katie would have known their sister, Katie Gretsch Von Hellerman who lived in California in the 1880’s. Katie was traveling with her step mother, Florentine Timm von Gerichten. Also in the traveling group were Florentine’s three daughters and her grand daughter. They were all relatives of the Gretsch children. It is interesting to note that Ella Florentine Marsten who was 8 years old at the time was also an orphan. Her father had died a year ago January and her mother, Anna Maria von Gerichten died in 1888. That this family group would arrive at the time that more Gretsch orphans were being cared for, is quite interesting. Orphaned children were nothing new to the Gretsch family. William Gretsch signed Florentine and Katie von Gerichten’s passport applications. His address was 98 Fulton Street. Finding William Gretsch’s signature on this application is proof that the Gretsch children were in contact with their California cousins, their mother’s side of the family. July 2 Philippine Morgner and Philippine Gretsch are both mentioned as being served with papers on this day. Presumably, this is the same person. This was a Saturday and Philippine Gretsch was served papers at 319 Marcy. Philippine Morgner was left with the papers for Jacob Gretsch at 319 Hart Street. This was the home of William Gretsch, the successful half brother of Philippine. At the time Philippine was very pregnant with her second child who would be born in July. She also had a one year old. This day, she was literally in two places at one time. July 12 Philippine Morgner along with Ursula Wintermantel,( the children’s grandmother) Wilhelmine Gretsch, Emilie Gretsch, William Gretsch, Frederick Gretsch, Carl Gretsch, Jacob Gretsch were cited and required to appear before the court at 10 in the forenoon to show cause why a decree should not be made appointing Louis Gretsch or some other person nominated by the surrogate the guardian of the persons and property of said Dora Gretsch and Ralph Gretsch , etc. July 13 Guardianship of the children was given to Louis Gretsch. Louie Gretsch was at this very time taking over the wine business from his half brother, William. July 24 Hans Max Morgner, son of Philippina and Max was born at 319 Mary Ave.
November 28 Hans died at 2:30 in the afternoon at 96 South 10th Street. This was a house. the death certificate was delivered to Mr. Fritz Gretsch. November 30 Hans is buried with his mother’s sister, Pauline Gretsch Benzing at the Evergreens Cemetery. May 16 Bena’s brother Carl has a son, Robert William Gretsch. May 26 Florentine von Gerichten and her four daughters and granddaughter return to New York City on the Fuerst Bismark. They are enroute to their home in San Diego. August A third daughter is born to Louis and Clara Gretsch. Her name in Wilhelmina. Bena and her husband Max living at 96 South 10th Street. This is where Hans died in 1892. March 15 Bena’s younger brother, Philip Gretsch and his wife, have a son Llewellyn Gretsch in California. It is just ten years that Philip has been in America and he is making a place from himself far away from siblings in Brooklyn. April 4 Emily and Wilhelmina Gretsch sign the papers to buy a home at 670 Decatur Street. July 25 Jacob Gretsch, Bena’s youngest brother, is living at the same address as Bena when his naturalization papers are formalized and he becomes a U.S. citizen. These papers are also signed by Fred Gretsch of 20 Hart Street. Perhaps both Max and Jacob worked for the Gretsch company at the time. April 28 Brother Fritz Gretsch dies in Hamburg, Germany. His death certificate is signed by his half brother, Wilhelm Gretsch who is now living in Heidelburg. Max Morgner listed as an engineer is living at 303 East 19th Street in Manhattan. This is the neighborhood where Max and Bena lived when they were first married. Just one block south. In fact, the houses were on the same lot and might have connected through the back yards to each other. This is just north of the area know as “little Germany”. Bena and her husband moved before the death of Bena’s brother. These city directories are prepared the previous year. So perhaps, Max had already stopped working for his brother-in-law. Philippine Morgner is listed at 247 East 21st Street. Why is her name listed and not Max’s? Februray 29 Emilie and Wilhhelmine pay off their mortgage in Brooklyn early. Emily made extra money making dresses. February 5 Philippine’s uncle, Conrad von Gerichten died in Dresden. July 3 Brooklyn Daily Eagle reports that C. Gretsch has passed the test to be a letter carrier. The test was taken in February. This is probably Bena’s younger brother Carl. October 27 Jacob Gretsch dies at his sister’s home, 247 E. 21st Street NYC. He was 30 years old. He was buried with the parents of his sister in law, Rosa Gretsch in the Everygreens Cemetery on October 30th. He died of tuberculosis. He had been sick one year. Window across the street from 247 E. 21st Street. Picture taken in 2002. The building that Philippine lived in is no longer there. Philippine no doubt took care of her brother while he was ill. Her husband was also sick at the same time. While she was nursing them, she might have looked out her window and seen this building at 248 E. 21st Street. To see an enlargement of this image, click on the image. Max Morgner bdgh. 247 E. 21st Street. Perhaps, Max and Philippine are running a bdgh (Boardinghouse) when he died. This was a profession that Bena took up again in Brooklyn. This is a larger view of the building across from Philippine address. July 25 Max Morgner died at 247 E. 21st Street (Manhattan). Like Bena’s brother, Max died of Tuberculosis and had been sick for one year. Max was buried in the Pleasant Hill Section of the Everygreens Cemetery. He was buried with his sister in law, Paulina Gretsch Benzing and his infant son Hans Morgner. August 9 William Gretsch, son of Jacob Gretsch and Bertha Wintermantel was married to Lucy Lucille Smith by Rev. Joseph A. Fisher. At the home of William Gretsch, 652 Lafayette Ave.
Bena had taken care of William since he was a baby. See his letter above on the date, April 23, 1883 describing his relationship with Bena. In this year Philippine made a dramatic move with her daughter from Manhattan to Bath Beach in Brooklyn. Soon train lines would connect this area to the City and many people including more members of the Gretsch family would choose to follow her there. Her daughter Johanna age 9 lived with her and went to school. The boarders included: Teresa Steinman, 36 years old from Austria, no occupation: Sigmund Steinman, 48 years old also from Austria, a real estate speculator: James Steinman, a three year old son: Catherine Pollatchink, 63 widow, from Austria, no occupation: Caroline Adler, 62 years old, from Austria, no occupation: John Anderson, 46 years old single from Norway, scaffold rigger: John Lee, 24 years old, from New York, carpenter: Lillian Peterson 17 years old, single, from Denmark Nurse. In 1901, there was an ad in the Brooklyn Eagle for “A Supper’s Hotel and Road House” at Cropsey Ave and Bay 22nd Street. This was very near where Philippine had her boarding house. They advertise among other attributes, bathing, boating and a large park overlooking Gravesend Bay. No doubt Philppine’s guests also enjoyed being so close to the water. At this time there were several Cottages for rent in the area. Some of the comforts they offered were “5 cent fare to City Hall, unobstructed views of the sea, station at 22nd street, 40 minute ride to New York city.” All of this contributed to the building boom of Bath Beach and Bensonhurst. Philippine was no doubt wise in moving into this area. She would stay her for the rest of her life moving at least three time but always within a two block radius of her original address. Her sister in law, Rosa Gretsch, would soon follow her lead. As would her nephew William Charles Gretsch and his young family. The amenities of other boarding houses in the exact proximity give a good picture of the neighborhood. Balwin Cottage at Cropsey Ave and Bay 22nd Street offered an unsurpassed location, opposite the park and unobstructed views of the sea. Richardson’s Seaview Hotel on Cropsey Ave at Bay 22nd St. formerly known as the Argyle offered 110 rooms. July 2 The Brooklyn Eagle writes” Probably no section of Kings County and Brooklyn Burough is more cosmopolitan and continental in the kind and character of its visitors and frequenters than Bath Beach and Bensonhurst. Nov 16 William and Lucille Gretsch’s first child is born, Lucille Leontine Gretsch in West Hoboken, New Jersey. She is baptized in the Presbyterian Church. October 3 Rosa Gretsch, widow of Philippine’s brother Fred, sells her home on Hart Street to Josephine Gatter. The home was valued at $8,000.00 and there was a mortgage held for $3,900.00. Louis Gretsch was the executor of Fred’s estate and Rosa had to receive the mortgage from him before she could sell the house. See Brooklyn Eagle of this date. October 19 William Charles Gretsch, second child of William and Lucille Gretsch is born. According to records Rosa Gretsch and her children moved to Bensonhurst, Bay 25th St and Benson ave. This was only a few blocks from where Philippine lived. Philippine was the first family member to move into the area. Her widowed sister in law soon followed. Rosa would live here for 4 years until her marriage to David Kling. January 20 Fred Gretsch, nephew of Philippine is married to Charlotte Sommer by a Lutheran minister. According to the New York State Census, 7A.D. 32 e.d. pp. 1718, Bay 20th Street and Benson Ave, Phillipina Morgner, Head, age 44, born in Germany, 27 years in America, boarding house Propritor, Johanna, daughter, age 13, Fritz Hesterman Boarder, age 32, born in Germany, 5 years in America, Clerk Dry Goods: Dietrick Alexander age 25 born in Prussia, ) years in America, Clerk Dry Goods; William Gretsch age 26 , clerk Wall Paper( this was the nephew of Bena. See April of 1883. At that time Bena lived with young William when he was a boy). Lucille Gretsch, Williams’ wife, age 26, Lucille Gretsch age 4, William Gretsch age 2. William Coyle Barnes, Boarder, age 62, printer newspaper, Margaret Barnes, age 62; Marguerite Albrig, age 32 no occupation; Ernst Aubertein, age 42, born in Germany, 7 years in America, Bookkeeper Dry Goods; Charles Nalchow, age 26, born in Germany 4 years in America, Bookkeeper Dry Goods; Rudolph Just, age 30 born in Switzerland, 7 years in America, Bookkeeper Dry Goods; Hans Narback, age 28, born in Switzerland 1 year in America, bookkeeper Dry Goods; Charles McCloud, age 48, Gold Beater; Caroline Mc Cloud age 47, John J. Conley, age31 Stenographer Tobacco Co., May S. Conley, age 30 born in England, 24 years in America, Helen Conley age 3. John Anderson, servant, age 53 born in Norway, 35 years in America, general helper; Hans Thomas, servant, age 35 born in Switzerland, 0 years in America, waiter, David Wain, lodger, age 32, Wales, 8 years in America, Jeweler. Picture of Lucille and William Gretsch at the time that they were living with Bena. This photo was given to me by Sally Gretsch Coulson, whose father William was the little boy in the photo. 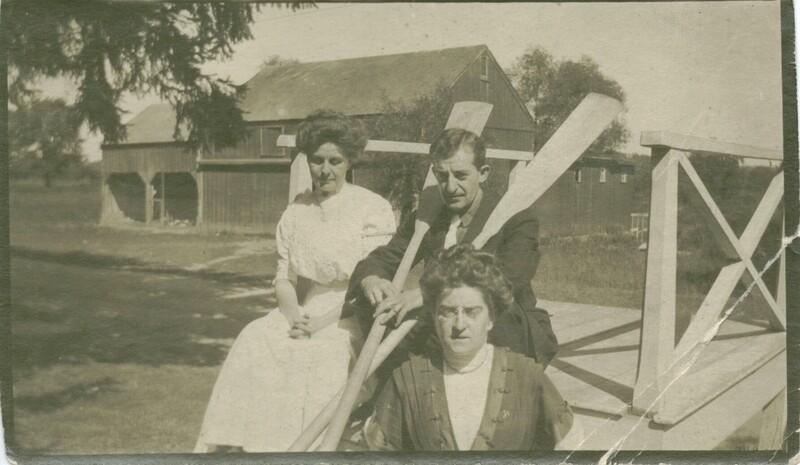 Picture of William Gretsch, his wife, Lucille, and his sister Dora Gretsch. Note the row boat and the beach. Philippine’s boarding house was very close to the beach. Perhaps, this picture found in the family of Dora’s daughter Elsa dates from this time. April 18 “The Great San Francisco Earthquake hit at 5:12 a. m and it was over in a minute. Much of San Fransicso was in rubble, and much of what was still standing burned in the firestorm that followed.” NYT, April 11, 2006. Bena had a younger brother Philip and a nephew who lived in San Francisco. It is not know if contact was made with them after the quake but surely the family was concerned and fearful for their relatives. April 7 Florentine von Gerichten was in New York City. Perhaps, she met with Bena and Johanna and encouraged the young Johanna to go to Europe to visit with her cousins. Florentine was the mother of Bena’s first cousins. Florentine was married to Bena’s mother’s brother. She traveled often to Europe from her home in San Diego, 1898, 1905, 1909.1911, 1914 to Europe to visit her daughter and sister who lived in Germany. September 11 Bena’s daughter Johanna applies for a US Passport. She intends to travel abroad for two years. She is 18 year old. She lists her address as Myra Cottage, DeBruyus Lane, Bath Beach. She has blue eyes and is five feet seven inches tall. No doubt Johanna met many of her von Gerichten cousins in Germany. March Johanna returns from Europe about the Prince Frederick Wilhelm sailing from Southampton. November 4 Bena’s first cousin, Katie von Gerichten Rensch arrived in New York City from Europe. She was traveling with her daughter, Anna Carolina Rensch age 17. They were on their way to San Diego. Probably they would visit there Katie’s, step mother Florentine Timm Von Gerichten and her step sisters. Possibly Bena’s daughter visited with this cousin of her mother’s while she was in Europe. Also living in Europe at this time were Bena’s sister, Katie Gretsch von Hellerman, Dorothea Timm von Gerichten, Bena’s aunt, her daughters Dolly Roessler and her daughters, Hertha and Erika. Also, Bena’s cousin Amy Dorothea von Gerichten Doecke. Johanna could have visited with all of these cousins. Did Katie and her mother look up Bena and other members of the Gretsch family while she was in New York? June 22 Johanna M. Morgner age 21 marries Fred C. Brose, rancher, age 29, in Wenatchee, County of Chelan, Washington State. Philippine is there for the wedding of her only child. They are married by a Catholic priest. Death records in California show that Fred C. Brose was born in Germany on September 10, 1882. He died on February 7, 1961 in Los Angeles. His mother’s name was Pischel. Johanna died on December 24, 1954 in Los Angeles. November 28 Dora Gretsch (32) marries in Detroit Daniel Sitzer (28). This must have caused quite an upset in the family. Philippine came to the US just months before Dora was born and knew Dora from birth. At the time of her marriage, Dora lived with her sisters, Emily and Wilhelmina Gretsch on Decatur Street. Dec. 12 Phillip Gretsch, a younger brother of Philippine dies in San Francisco from Tuberculosis. He died at the German Hospital. He had lived at Hotel Belmont at 16th and Folsom. Perhaps, Philippine visited her brother while she was out west for her daughter’s wedding. His occupation is a wine cooper. Did he perhaps go to California to work for his brother Louie who was in the liquor business. Philip had a son Llewelyn who was born in 1896. By 1910, Philip and his wife Louisa were divorced. Llewellyn, his mother and her new husband were living with Louisa’s widowed brother Jacob Winterberg, a tailor. Perhaps, on this trip our west, Philippine also was in touch with her sister Auguste Katharine’s daughter, Helma Von Hellerman. Helma was about the same age as Bena’s daughter Johanna. These cousins, Johanna and Helma, granddaughters of Anna Maria von Gerichten both lived in Los Angeles at the time of their deaths in the 1950’s. June 28 Archduke Ferdinand and his wife are assassinated. In August WW1 begins. Dec 23 Philippine Gretsch Morgner dies of “Illumination Gas poisoning”. An article in the Brooklyn Eagle of that date reads “Suicide By Gas In Her Boarding House. Mrs. Morgan, Keeper of Myra Cottage Ends life in her Bath Beach Place. Mrs. Philpmenia Morgan, 53 years old, who conducted a boarding house at the foot of Bay Twenty-third street know as Myra cottage, committed suicide today by inhaling illumination gas in her home. At 8 o’clock this morning, John Anderson, a boarder smelled gas escaping and made an investigation. He discovered that it came from Mrs. Morgan’s room, and when he could get no response to his knocks, he forced open the door and discovered her lying upon her bed. All the gas jets in the room had been turned on and the windows tightly fastened. N.B. John Anderson had been living in the same boarding house with Phillipine for more than ten years. First he worked as a scaffold rigger and later he worked in the boarding house as a general helper. December 26 Phillipina was buried at Evergreeen Cemetery. She was not however buried with her husband and son who were buried with her sister Pauline in Mount Pleasant grave # 5269. Although there was an empty space in this plot. However, she was buried with her brother Jacob, her brother in law William Vonschlepergrell, and Rosa Gretsch’s adoptive parents Caroline and Adolph Schnappauf. This Mr. Tabor plot # 234 was now full. Philippine’s name is not on the headstone. To see a larger version of this year 2000 letter from The Evergreens Cemetery, click on the image. January 30 Johanna M. Brose petitions the court for Letters of Administration of the goods, Chattels and Credits which were of Philippina Morgner.” That said deceased at the time of her death was possessed and the owner of certain personal property, the value of which does not exceed the sun of Twelve Hundred and Fifty Dollars. That the deceased was not seized of real estate. The Petitioner resides at No. 1460 President Street. Your petitioner also adds that Fred Gretssch of 1460 President street, in the Borough of Brooklyn be joined as co-administrator. Notarized in the state of Washington, in Wenatchee. Fred Gretsch and Johanna Brose approved as petitioners. December 28 Antonio Hertlein, age 47, is buried at Lutheran Cemetery. She died at Bay 19th Street. Her body was found in the water after a terrific sudden storm. Antonio’s sister Sophia was married to Bena’s brother Carl. Surely Antonio and Bena knew each other. Years later in 1923, Carl Gretsch would be buried along side Antonio and in 1945 Sophie Gretsch was also laid to rest here. Since Antonio died so close to the place where Philippine lived and so close to the date that she died just one year earlier, one wonders if there is a connection between the deaths of these two women who surely knew each other. It is quite possible that Antonia’s death like Philippine’s was a suicide. Johanna Morgner Brose has a baby boy in Washington State. This is possibly when Hertha began her travels west. She went with her family’s blessings to Washington to help her cousin at the time of her child’s birth. Johanna N Brose (27) is living in Winatchee, Washington with her husband Fred, and her son Frederick M, 9 months old. There are two lodgers living with them, Fred( 28) and Ruth (27) McMillan both high school teachers from the Midwest. Johanna it seems is carrying on her mother’s profession of taking in lodgers. US Census shows Fred and Johanna living with their son Fred (age 11) in Los Angeles. Fred is a salesman for an oil company. Dec. 24 Johanna died in Los Angeles, Ca. she was 63 years old. Her mother, Philippina died on December 22, 1914.